I am looking for a clipboard manager with search functionality. I love CtrlR in the bash shell and would like to have the same functionality like that in clipboard manager for my desktop. I type the next text. I want to insert "internationalisation" again. I hit some magic key stroke. Then "inter" and then I want to see a list of all strings I copy+pasted during the last days. I choose the one I want. Done. With diodon I get a long list of last matches, that's good, but not perfect. As stated in the comments, I've written a simple clipboard manager indicator with use of Python 3 and a few zenity dialogs, which allows manipulating clipboard contents, as well as has search functionality. Search functionality, in particular, makes use of Python's re module, which means you can use regex expressions for more fine-grained search. Each text entry has 4 options in its submenu: insert text into clipboard, append text to the end of what's currently in cliboard, prepend text to the beginning of current contents, and remove it from history. In the animation below you can see demonstration of text being copied, clipboard appended to with the indicator, and finally the test string is searched via simple search dialog. The found contents are displayed in a simple text view dialog with timestamp in user's locale (if it's set). The found text then can be copied via selecting text and using standard Ctrl+C shortcut. Yes, that's Ubuntu (16.04) with launcher on the bottom. The indicator was made in one day, thus it is fairly minimalistic in nature as of right now. In future there will be additional features added, such as preferences dialog. The menu length and text width are currently hard-coded to 10 items in the indicator and 30 characters max for each entry. If you want to make a feature request, please submit an issue ticket on project's GitHub page, where its source code is also available. Implemented file operations feature - loading a text file into clipboard and writing clipboard contents to file. Added editing submenu. Users now can convert clipboard contents to upper/lower case, trim words/characters from beginning or end of the text, and replace expressions(uses python's re regex). 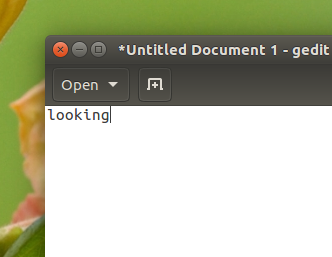 Added option for opening a history item in text file ( similar to bash's fcedit). So far this only opens default program set for the plain-text filetype. couple improvements and bug fixes. Added "Pinned submenu" and ability to "pin" specific items from clipboard history. Code refactored, certain parts rewritten for repeated use. Clipit is the best among all. CopyQ is a cross-platform, well-designed and fully-featured clipboard manager (my favorite). It features among others a (very handy) command line interface. 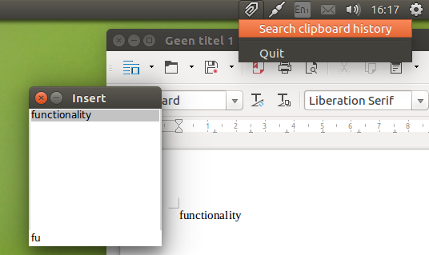 Glipper is a clipboard manager, it can be installed from the Software Center. You can try Keepboard. It is easy to use and seems to be stable and reliable. I use Clippy, a docklet that works with Plank (I don't use Unity). I think Clippy also comes with Docky. CopyQ is an advanced clipboard manager which is available on most if not all platforms. 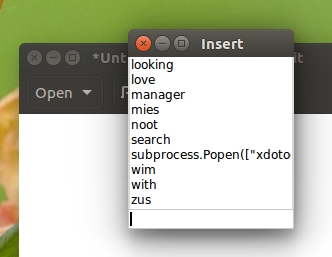 Pastie is a simple clipboard manager for Ubuntu and makes use of the AppIndicator. It has some cool features. Parcellite is a stripped down, lightweight GTK+2, basic-features clipboard manager for Linux. Glipper is a clipboard management tool for GNOME desktop environment, users can extend its functionality using plugins. It now uses the App Indicator to support Unity and Gnome Classic desktop environments in Ubuntu. Clipit is a lightweight GTK+ clipboard manager. It is feature rich and actually forked from Parcellite, but includes some extra features and bug fixes. Keepboard is a cross-platform clipboard manager that allows users to save clipboard history. I've removed some from the list those that do not work with Ubuntu. So it doesn't add up to 10 in the article title. There are other reviews of the same packages listed above found in (makeuseof.com - 6 Tools to manage Linux clipboard) and in (maketecheasier.com - Enhance Linux clipboard with clipboard manager). At the end of the day the package you choose is the one that you are most comfortable with. No one can say for sure which package that will be. Almost all of them offer searchable history like you want it but which one has the interface best attuned to your way of thinking? With the setup below, it is extremely easy to search recently copied (strings from) text, and paste it with a double click into your documents. Setting up is not the simplest of all (currently), usage is extremely straightforward though. Start copying tekst, which is automatically remembered (up to an arbitrary number of strings, remembering the last n- strings). Open a gedit window and call the little window with your shortcut, and use the utility as explained in the introduction. Currently, the utility works with all applications which are compatible with Ctrl+Alt+V. The version below also pastes in gnome-terminal. to start the indicator + background script. Choose Search clipboard history from the menu to call the little window. The app unity-scope-diodon supports this. If I hit super-b my eyes see 12*7 = 84 times the same big icon, which I am not interested in at all. It would be nice if diodon itself would support this. 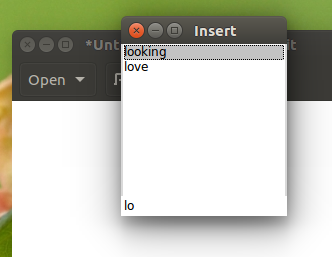 CopyQ is awesome advanced Linux clipboard manager. It has tons of valuable features (including Ctrl-R like search). Not the answer you're looking for? Browse other questions tagged software-recommendation indicator clipboard text history or ask your own question. How to only append to clipboard (but not overwrite current data)? What utility is like Ten Clips, providing an enumerated clipboard? What tool adds unlimited clipboard and searchable retrieval? A clipboard manager that also supports images? Can I have a textual Alt-Tab functionality?